Edward (Ted) Hatchard was conscripted into the Essex Regiment but fell ill and died of broncho-pneumonia before he saw active service. Edward Charles Hatchard was born on 14 January 1880 at 23 Hope Street in Battersea, the fifth of six children born to Henry John Hatchard (1844–1898) and his wife Edith Eliza Hawkins (1848–1910). Henry had been born in Lymington, Hampshire and married Edith (from the Isle of Wight) at Southampton in January 1867. After the birth of their first two daughters in Southampton, the couple moved to Battersea in 1871/72, where Ted was born in 1880. At the time of Ted’s birth, his father was described as a “general dealer” and in later censuses he was described as a “poulterer”. 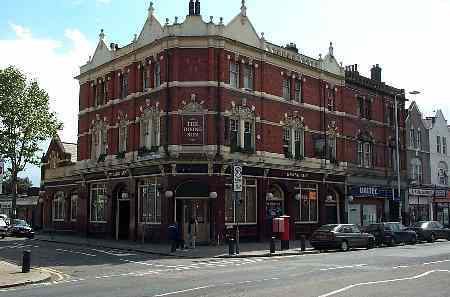 At the time of the 1901 census, Ted was living with his brother in law, Lewis Ascott, at the Rising Sun public house at 528 Romford Road, Forest Gate near Stratford in east London, when his occupation was given as “ship’s steward”. Lewis Ascott (1841–1914) had been the publican at the Rising Sun since 1896 (he was previously the publican at the Norfolk Arms in North Road, Fulham) and had married Ted’s elder sister, Ellen, in 1895, after the death of his first wife four years earlier. Ellen was nearly 30 years younger than her husband, but died within five years of her marriage, aged only 30. On 12 July 1909, Ted married Lilian Emily Nelms at the West Ham Registry Office. Lilian had been born in Bromley (now Bromley-by-Bow) in east London on 17 September 1886; her father and grandfather came from a long line of lightermen on the River Thames. Ted and Lilian had three children: Edward John Charles, born in east London on 3 February 1910, Walter Lewis (known as Lewis), born in east London on 27 October 1911, and Lilian Ellen, born at 14 Addison Road, Hove on 9 February 1916. On his marriage certificate (in July 1909), Ted’s address is recorded as 528 Romford Road (i.e. the Rising Sun) and his occupation was “barman”. At the 1911 census, Lewis Ascott was still the licensee at the pub while Edward (now a “hotel manager”) was living at 210 Sherrard Road, which is in the next street from the pub, less than a quarter mile away. Lewis Ascott died on 4 December 1914, and appointed Ted as his executor. Lewis left an estate valued at £12,705, including the pub. After the pub was sold, Ted received a large part of Lewis’s estate and moved, with his family, to Hove. When registering his daughter’s birth in February 1916, he gave his occupation as “Retired Licensed Victualler”. Lewis Ascott had been a fairly prominent Freemason; he was initiated into Westbourne Lodge No 733 on 18 January 1866 at The New Inn, Edgware Road, London, going on to become Worshipful Master of the Lodge, and a founder of Westbourne Chapter in March 1868. On 5 May 1894, he was a founder of Fulham Lodge No 2512. As Edward was living at the pub with Lewis, he must no doubt have been aware of and influenced by Lewis’s masonic activities. Edward Charles Hatchard was proposed into Adur Lodge No 2187 by Bro. Frank Winn JD (a fellow publican) and seconded by Wor. Bro. Christopher Pell PM. His age was shown as 40 in the minute book and 39 in the membership book, although his correct age was 36. He was initiated on 26 April 1916 by Wor. Bro. Pell, passed on 25 October and raised on 20 December 1916. His Grand Lodge Certificate was endorsed and sent to his widow on 9 February 1918. In view of his short period of time in freemasonry, he never progressed beyond the rank of Master Mason. Little detail is known about Edward Hatchard’s military service. He was probably conscripted in July 1916, signing on in Hove, initially with a service battalion, before joining the 15th Battalion of the Essex Regiment as a private with service number 350184. The 15th Essex was created on 1 January 1917, but was not sent to the Western Front until May 1918. 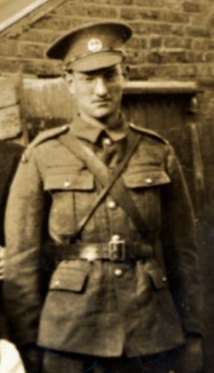 Having completed his training with the 15th Battalion, during which he achieved the rank of lance-corporal, he was attached to the 2nd Battalion and sent to France. In October 1917, the 2nd Battalion had been involved in intense fighting in Belgium at Poelcapelle and Passchendaele and suffered heavy casualties, before being withdrawn to France. It is unlikely that Edward was involved in any major battle. The grave of Edward’s widow at St Andrew’s Churchyard, Althorne, Essex. 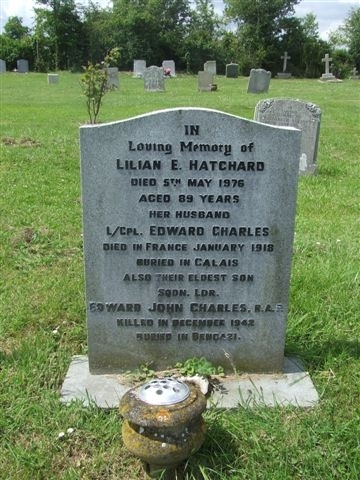 Edward Hatchard died at the 30th General Hospital, near Calais on 20 January 1918. The cause of death was recorded as broncho-pneumonia “commencing while on active service”. He was buried at Les Baraques Military Cemetery in Sangatte, west of Calais in Plot II, grave C. 10A. He was awarded the British War Medal and the Victory Medal. He does not appear to be commemorated on any UK war memorial other than the Masonic Roll of Honour. He is, however, commemorated on Lilian’s headstone in Althorne, Essex. At the time of his death, his widow was living at Lorna House, 14 Addison Road, Hove, but shortly afterwards Lilian returned to Essex to live at “Rosemead,” 32, Southbourne Grove, Westcliffe-on-Sea. Lilian remained in Essex and died in May 1876 aged 89 at Althorne (about 20 km south-east of Chelmsford). In October 1934, Ted’s two sons, Edward and Lewis, together with Edward’s son David (aged 4) were rescued after their dinghy overturned in a gale off Leigh-on-Sea. During the Second World War, Edward served with the Royal Air Force as a Squadron Leader. He was killed in Libya on 14 December 1942 and is buried at Benghazi War Cemetery. Wor. Bro. Grahame Carr PDProvGM (Sussex) for supplying the extracts from the Adur Lodge minute book for the period from 1903 to 1918. Sara Sheldrake (Edward Hatchard’s great-great-granddaughter), for permission to use the photograph of Edward Hatchard and for invaluable assistance with the family history. The members of the Great War Forum for help with Edward Hatchard’s service history. The National Archives: PIN 82/89/49 Edward C Hatchard. Unit: The Essex Regiment.